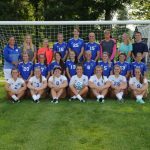 Saturday, September 2, 2017 9:00 AM LaVille High School AWAY 8 Bremen Tournament HOME 0 Game Recap The Lady Lancers brought home the Bremen Invitational Trophy this past Saturday for the 3rd straight year! Senior Haylie Cox received the Most Valuable Player on the day. The Lancers drew Trinity in the first round of play.